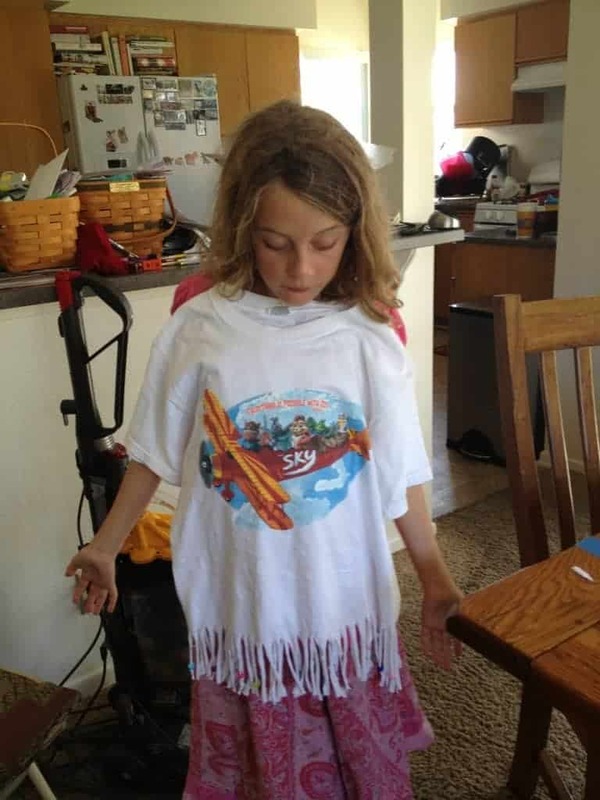 A couple years ago, I noticed two little girls on the last day of Vacation Bible School who had cut their VBS T-Shirts and added a very cute fringe to the bottom and sleeves. 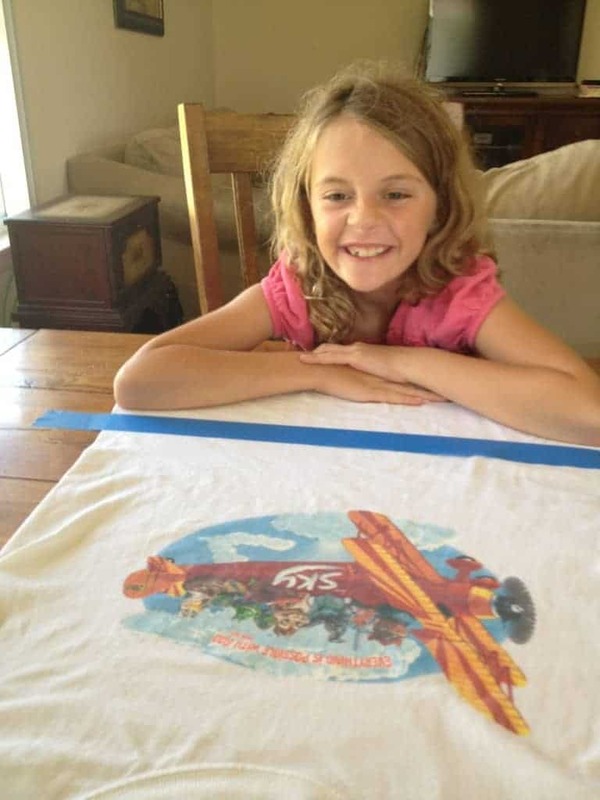 I kept that idea in the back of my mind, and this year when Anna attended VBS with her best friend, I asked them if they wanted to embellish their t-shirts for the last day. Both were excited about the project, so I started searching for instructions. I searched all over Pinterest and Google and I could not find any information about embellishing a child’s t-shirt. I changed my search terms a dozen times, but came up with a blank screen each time. Finally, I found a website for fringing an adult t-shirt to create a halter top. Not exactly what I was looking for, but I figured i could adapt the technique for what we wanted to do. 1. Tape across the shirt where you want the fringe to stop. We taped up about 3 inches from the bottom. 2. Cut once in the middle. 3. Cut each of those sections in half. 4. Keep dividing the sections in half with a new cut until you have the fringe thickness you want. 5. 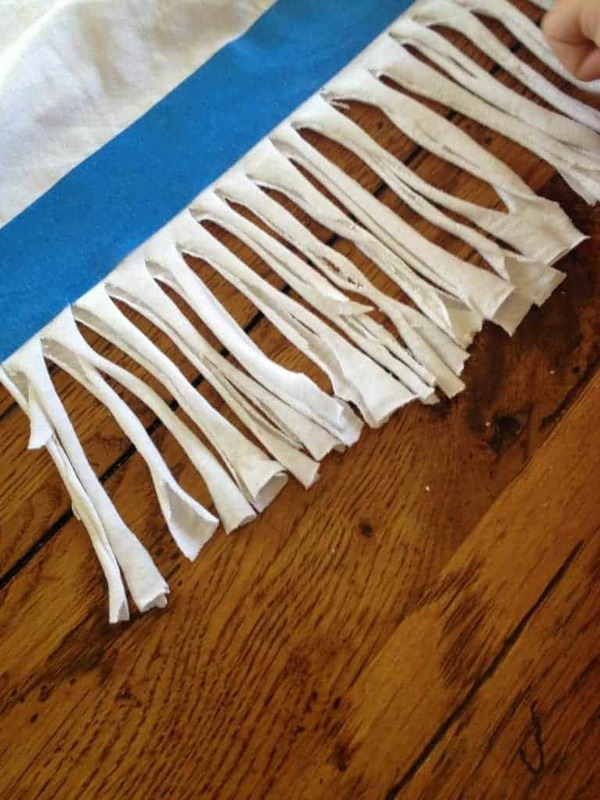 Pull each fringe individually to stretch it out. 6. Add a pony bead at the end and knot. Those are my basic instructions, and of course this would work for the sleeves too. We did not do the sleeves because my girls were tired after all that cutting and ready to be finished after we fringed the bottom and added beads to about half of the fringe. Both girls loved their shirts for VBS, and Anna still wears hers often to sleep in even though she doesn’t like the colors for anything after VBS was over. I let the girls do the work, and helped when help was requested. The results were cute but not perfect. It’s important to give your children the creative freedom they need without requiring perfection. Cutting and beading are both fantastic projects for fine motor skills. 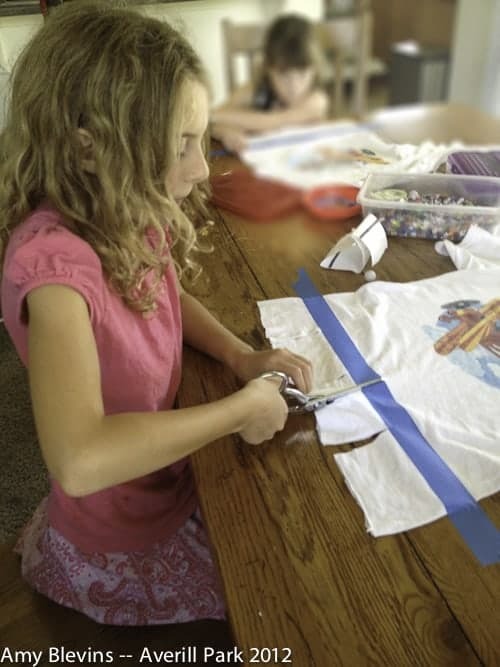 This is a great way to dress up a simple t-shirt for your little girl. After we finished this project, a friend of our gave us a swim-suit cover up for Anna that was a little too long but exactly the kind of thing she loves to wear. I added a fringe and beads for her in about 25 minutes altogether following the same instructions, and cutting off enough length to make it just fit so she has room to grow.